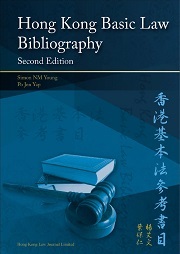 When first published in 2006, The Hong Kong Basic Law Bibliography was the first full-length bibliography devoted to the literature surrounding the Basic Law, Hong Kong’s constitution, following the resumption of Chinese sovereignty in 1997. It remains the only bibliography of its kind. The second edition adds another 100 pages to the length of the first edition. It continues to capture local and international, English and Chinese sources, and provides reference call numbers for those items found in Hong Kong’s public and university libraries. It also includes a selected bibliography on Macau’s Basic Law. It is a valuable research companion for students, teachers, practitioners, government officials, and scholars researching on Hong Kong’s Basic Law. The book is a research output of the Centre for Comparative and Public Law. Click here for ordering information.